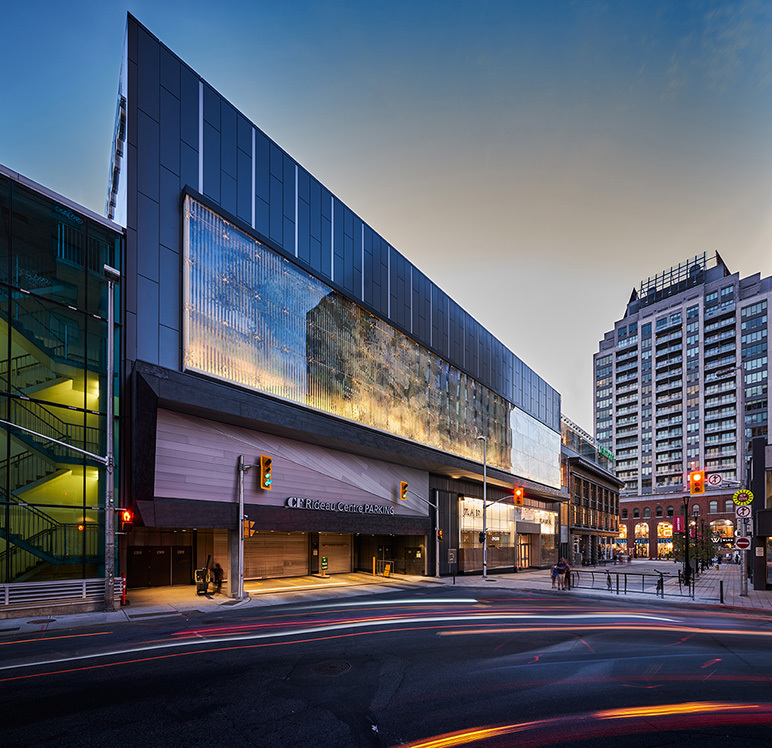 The Rideau Centre, located in the heart of downtown Ottawa, underwent a major revitalization and expansion to reinforce its status as the leading shopping destination in the city. A complete interior renovation of the existing Centre provided a fresh, modern and contemporary look, premium finishes, modern amenities and a new 35,000 ft2 dining hall. The 230,000 ft2 expansion provided four new levels of retail and dining as well as three levels of underground parking. The project includes a complete replacement of the existing façade that reinvigorated the building and the area including a refurbished Ogilvy Building heritage façade. Currently one of Ottawa’s busiest bus transit hubs, the project incorporated two access points directly into Rideau Centre, an important stop along the new LRT Confederation Line. 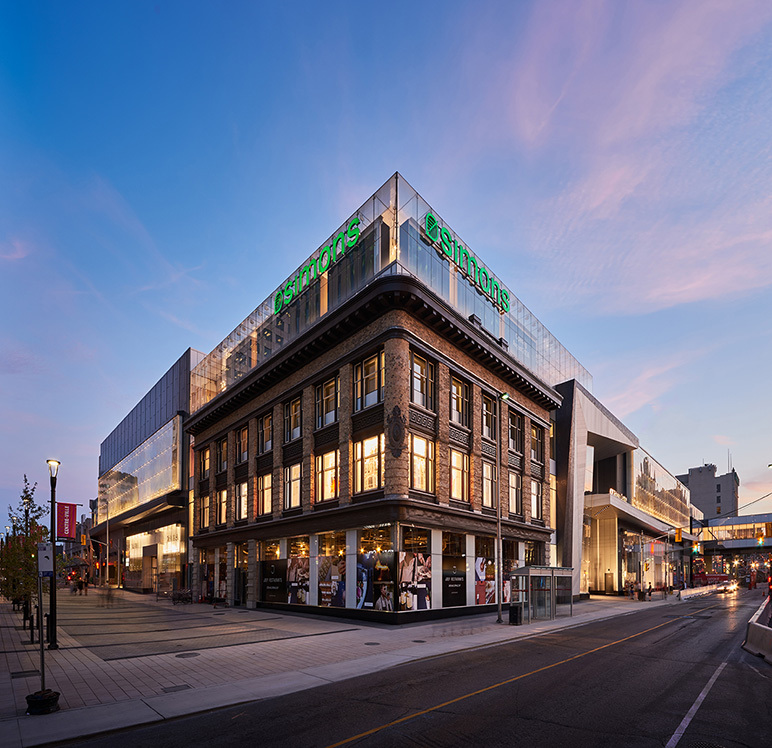 The revitalization has attracted many premium retail brands as tenants including Nordstrom and La Maison Simons. Challenge: Originally planned as a three level mall with two levels of below grade parking, the project was subject to on-going revisions to accommodate the changing retail program. This included the addition of a fourth floor to accommodate a new anchor tenant which was accommodated during the construction period. The new tenant added escalators, stairs, and elevator requirements which required on-the-fly revisions as the construction was underway. Solution: By maintaining a consistent team led by a hands-on Project Executive throughout the process, including extending our design team through the construction period, enabled them to make the changes to accommodate the schedule. Working with a local engineering firm to supplement our service also aided in successfully overcoming the challenge of poorly documented existing conditions.